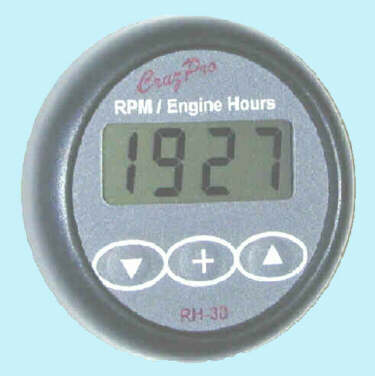 RPM (0-9999), Engine Hours (0.0-9999), Elapsed Time (00:00 mins/sec to 99:59 hrs/mins) Max. RPM Alarm, Max RPM seen storage (reset-able). 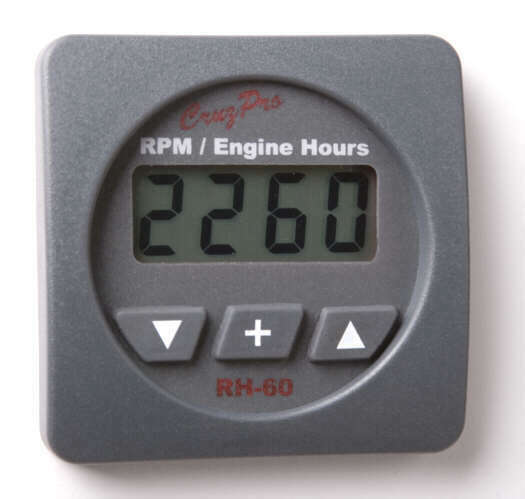 The RH60 Digital RPM/Engine Hours/Elapsed Time gauge is a four digit digital display of engine RPM, total engine hours, elapsed trip time and maximum r.p.m. seen. The RH60 works with any engine and can be driven from a wide range of signal frequencies and amplitudes. Front panel calibration is provided for spot-on accuracy to within 1 RPM. 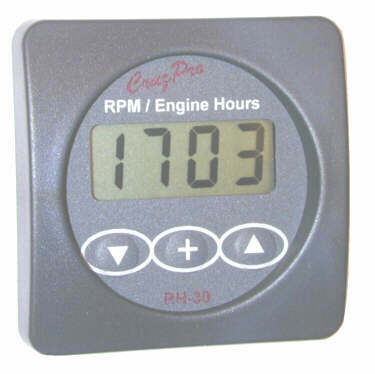 A seperate engine hours countdown alarm can be set to warn you to perform needed maintenance every set number of hours of engine running time. When activated, the RH60 built-in 85 dB alarm will sound and the display will flash. Five levels of backlighting can be selected and all set-up, calibration and alarm values, are saved to non-volatile memory. Data is output on an NMEA 0183 compatible serial data line or that screw terminal can be programmed as an external alarm output. All constants and calibrations are pre-set during manufacture but you may alter these settings to suit your particular needs. Calibrations can be altered over a wide range using the front-panel switches to compensate for different alternator pulley diameters, gear tooth sensors, magnetic and optical sensors, etc. Any engine is easily handled. 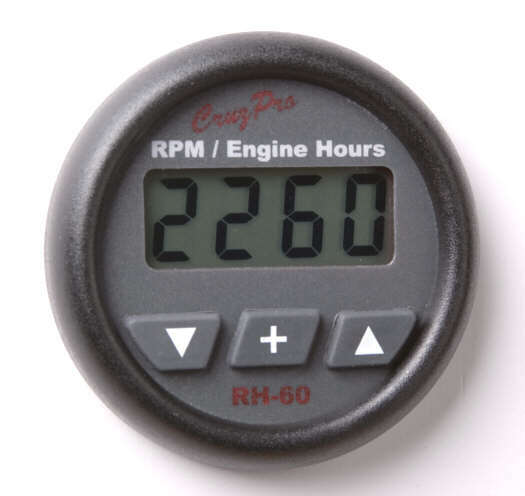 With a press of the button you can display RPM, Total Engine Hours, Elapsed Trip Time and Maximum RPM seen (since last reset). An engine maintenance alarm can be set using the front panel switches and it will remind you when its time to change the oil, check water levels, etc.. There are 13 levels of display damping that can be user selected. The RH60 draws only 0.017 amps and 5 levels of backlight (including OFF) can be selected from the front panel and is saved to non-volatile memory. The RH60 outputs RPM, Engine Hours, and Elapsed Time on the standard NMEA 0183 serial data line at 4800 BAUD. This ASCII information can be used to log performance or repeat the display information at a remote location on the CruzPro RP30 and/or RP110 data repeaters (see www.cruzpro.com/rp30.html and www.cruzpro.com/rp110.html). If NMEA 0183 serial data is not required, then the output terminal can be programmed as an external alarm output pin.